Maybe you think they’re kitschy, or maybe you think they’re an endearing statement of who you are, or maybe you don’t know what I’m talking about. However you feel about pub signs, there is a good chance that you may not know how they came to be. The history of the pub sign actually predates the sign. The traditional British pub has its roots in the Roman road system when the Romans had small retail units spaced throughout the empire to provide supplies and refreshments to travelers and city dwellers alike in buildings called taberna. Though the empire crumbled in the year 476, the system of ale houses did not. The tabernas became public houses (as opposed to the private homes) these public houses or pubs were where the homeowners dwelled and ran their business. 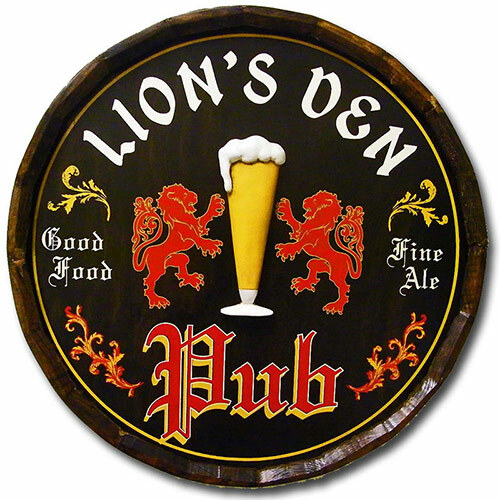 This personalized pub sign is made from the top part of a barrel, and you can have it personalized for you here. When these Anglo-Saxon brew-masters or inkeeps had a batch of ale ready, he or she (women historically were some of the best brewsters) would hang a bundle of green brush on a pole to indicate that the brew was ready to be enjoyed. England became so dotted with these public ale houses that laws were implemented to limit their numbers to one per town by King Edgar in 965. By this time the use of signs were in common place to invite the largely illiterate British peasantry in for a frothing beverage. Often these pub signs had dramatic stories behind them as with the Flying Monk. Where a local monk felt so confident in his faith and mans ability to take flight that he attempted to take flight off the roof of the church, only to break both of his legs, the head abbot forbid him to take flight again. The town apparently thought that naming the pub after him would be a touching memorial of the occasion. Flying Monk aside, Northwest Gifts has a huge selection of pub signs to choose from. 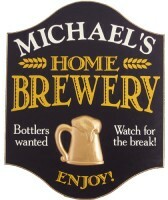 Continue the tradition and memorialize your man cave or dorm room with a personalized pub sign with your own name . Those are some pretty sweet signs. I think my wife is going to become a brewster.